All appears that the volcanic Eruption in Eyjafjallajökull has stopped. No activity has been in the volcano over the last few days and there is hope that the activity has stopped. No news have been reported of ash and only minor seismic (earthquakes) unrest has been noted. However, the volcanic eruption has not formally been declared over and there is still a risk of mud flooding from the glacier. Even though the volcanic activity has stopped, there is a chance that this period might be minor stop, as happened when the eruption at Fimmvörðuháls stopped and Eyjafjallajökull began. In between there was only short time where there was no activity. However, it is hoped that the volcanic activity will formally come to an end over the next few days. This is a great relive for local farmers in the vicinity of the Eyjafjallajökull volcano, since livestock has to be kept inside due to ash fall. However, there is a great deal of ash on hayfields and other grazing sites which is harmful to livestock. Strong winds in the south are blowing and spreading out the ash, which helps cleaning. Farmers wish though for heavy rains, for the water spreads out the ash better than the wind and are of a less disturbance than the wind. A period of reform is now at hand for the people that are neighboring the volcano. Ash has created a lot of trouble but it is hoped that will end and farmers can grow their hayfields and herd their sheep to the highlands for grazing. The positive effect is that the ash carries a great deal of nutrients to the soil, so long term effects will be positive. High quantities of ash is however harmful for grazers. The Arctic Portal will keep on following the volcanic eruption and its aftermaths. The eruption remains steady and is at the moment distributing a significant amount of ash. Ash fall has been reported in Reykjavík and is this the first time since the begining of the eruption that this has happened. Domestic flights have bee grounded for the day as well as international flights from Europe to Iceland. Scientists state that the end of the eruption is still impossible to predict and that the volcano shows no signs of slowing down. Update: 11.05.10: There has been considerable volcanic activity or more specifically earth quakes under another volcanic field in the region called Bárðarbunga. Public safety authorities do not believe that there is much risk that there will be an eruption and that there is no need to be alarmed. It is there for rather for informative reasons that we post this update. Bárðarbunga-Grímsvötn volcano has not erupted in historical times and lies at the center of the volcanic belt that lies from the southwest to northwest of Iceland and is one of the two largest in the world (the other one is under Hawaii).The fissure under Bárðarbunga is estimated to be 200 km long and up to 25 km wide and is ice covered. The biggest amount of lava dispersed in Iceland, and in fact the world, came from Bárðarbunga approximately 8500 years ago. Icelandic authorities do not have an emergency reaction plan for this volcano, but state that such a plan will be done as it is wise to have one, without any actual fear that the main volcanic area will erupt. It has also to be noted that there have been regular eruptions in the proximity of these activities in Gjálp 1996 Grímsvötn 1998 and 2004. In 1996 when Gjálpur erupted there was very similar volcanic activity under Bárðarbungu. The likelihood of an eruption in the main volcanic field under Bárðarbunga is there for not considered very likely, but if it were to happen it could be an eruption of immense proportions that could once again make the one we have seen seem like a firecracker. Update: 05.05.10: The volcanic activity is still higher than it was a couple of days ago with increased seismic activity- the tremors are originated at 23 km below the surface and move upwards. This indicates that new lava is searching upwards and putting presure on the existing lava. It is therefore expected that the eruption will continue with full force for a while. The ash is having minimal effect on air trafic- compared to what it did recently. Currently a no-fly zone has been put in place Northern Ireland's three airports- which seems to be the only place were the ashfall is having any significant effect. Update: 03.05.10: The volcanic activity under Eyjafjallajökull has been on the increase for the last couple of days. Specialists do not have any clear cut explenation why this is happening or what consequence this may have. We will continue to monitor the situation and bring new information as soon as it arrives. Update: 27.04.10: The volcanic activity remains steady for the timebeing, and it's still hard to tell when the eruption will come to an halt. Flights from Iceland have been limited over the weekend- with some international flights leaving from Akureyri Iceland. Which is a smal town of approximitely 20.000 people in the North of Iceland and the home to the Arctic Portal. Update: 22.04.10: The volcanic activity in Eyjafjallajökull has been decreasing steadily, there is however still to early to predict when the eruption will stop. Flights have been steadily returning to normal in Europe. Ironically enough international flights from Iceland towards america have remained on schedule throughout the whole eruption. It is however expected that tomorow international flights will go through Akureyri airport and Egilstaða airport as Keflavík airport, Icelands main international airport will be completely closed for the first time since the eruption. Update: 20.04.10: The live feed is back on track and can be seen from the Arctic Portal front-page. Update: 19.04.10: We are having some problems with the live feed from the eruption- as circumstances from the site have become far more complex with the later eruption due to ashfall and that it is located in a more difficult terrain. Update: 19.04.10: A norwegian passanger plain, has just now carried out an emergence landing in Bodo Norway. The plain that was carrieng 17 passangers was on a regular schedule when the pilots realized that one of the engine shut down. Local authorities are in the process of examining the engine to see if the malfunction can be traced to volcanic Ash from the eruption here on Iceland. Update: 19.04.10: We here at the Arctic Portal just came across the most amazing image of the eruption by photographer Terje Sorgjerd. One could imagine that this may be a prime candidate to become the World Press photo of the year. To see the image, please click here. 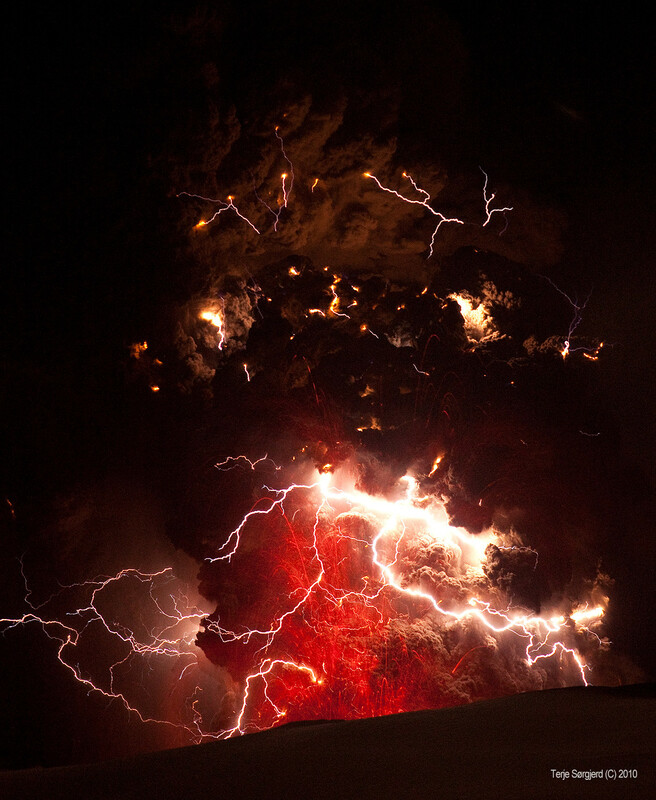 As can bee seen in the photo the power unleashed in the eruption is humbling and truly shows us who is actually in control on this planet of ours. Update: 19.04.10: The Icelandic met office estimates that the eruption has shifted towards being a lava eruption. This indicates that water does no longer have access to the crater resulting in a lover ash cloud. According to eye-witnesses there are loud explosions followed by lava gushes by the size of an SUV streaming out of the crater. This will hopefully mean that flight restrictions will be reduced. The flight restrictions have also been highly critizised and there are many that belive that they are severely redundant for most areas. Update: 16.04.10 Yesterday evening there was another instream of flooding from the glazier, larger than the previous that had occured. The gaps that were created in the highway are belived to have minimized the damage significantly and the bridge over markafljót still stands. National public safety authorities will meet with the cabinet today to inform them of the health hazards created by flooding and ash-fall. Local public safety authorities across the country will also meet today to discuss threats created by ashfall. Food and supplies have been running low in the southern regions, since traffic from Reykjavík has been disrupted and cargo trucks forced to drive the other way around the country. Ash fall has been significant in the region, and residents have described the scenario as being dark in mid day, and in some instances visibility around 7-10 meters. The coast guard airplane TF-Sif flew over the eruption site yesterday and took some thermal imaging pictuers that display a rather gnarly persona in the volcano. With a fair level of humor local newspapers describe the picture as " a portrait of the devil himself"
The volcanic eruption has been steady and shows no signs of backing down, and local geologist state that it is virtually impossible to predict how long the eruption may last. There have been significant problems retreiving lava sampels for testing since the eruption is located within a deep crater, which is still partially covered by the glacier. These samples have however been retrieved and are being analyzed. Páll Einarsson geophysisist states that the future of the eruption is hard to predict "first and foremost geophysisist build predictions on prior experience and there is not much prior experience with the eruption in Eyjafjallajökull. The only eruption that there exist considerable knowledge about is the eruption in 1821 and the predictions that your are able to make from one eruption are limited. The eruption 1821 lasted longer than a year and was followed by a significant amount of ash fall. It is therefor likely that the eruption will last quite a bit longer". Helgi Björnsson glacierologist further explains that falllines lie between Eyjafjallajökull and Katla volcano and a little lava injection between regions could stir Katla into motion which is a far bigger volcano- as covered previously here below. Volcanic eruptions are in general quite common in Iceland and there have been 205 volcanic eruptions, of various types and scales, from the settlement of Iceland around 870. Update: 15.04.10 All air trafick has now been stoped in British airspace due to the volcano. An interesting news coverage can be seen at the BBC website, with an overview of how the ash cloud is spreding towards europe. Local health authorities have now issued recomendation on how to deal with the ash fall. Icelanders are asked not to be outside without a valid reason and people working outside are asked to wear dust masks, which are available at local healthclinics. The ash may cause breathing problems for individuals, that may be extensively sensitive. These directions are however precautionary and little threat considered at this moment from the ashfall. Update: 15.04.10: The eruption in Southern Iceland was steady during the night with similar power as it showed yesterday. During the night there were two minor floodings, which did not cause as much damage as the flooding yesterday. There has been an increase in ash fall and it is starting to severely affect flights in Northern europe. Heathrow, Gatwick and Stansted in London have been closed as well as Belfast and Newcastle. All air traffic over Norway has been prohibited and is increasingly being prohibited in Sweden. Other airlines have been forced to postpone a number of flights or change their routes. Keflavík, Icelands main international airport has however not been closed as due to wind currents it is still possible to maintain traffic other than to Northern Europe. Residents in Vík í Mýrdal are on alert if the far more powerfull volcano Katla would start to stir. Historically it is known that activity in Eyjafjallajökull is known to put Katla in motion and it is estimated that if there is a large eruption in Katla it could make the activity so far seem like a firecracker. So far there has not been a significant amount of images or videos from the activity but below you can see some video footage taken of the new eruption. It can be estimated that it is taken from the Airplane of the national coastguard as other flights over the area are prohibited. This eruption is of another nature than the previous eruption and is categorized as a subglacial eruption which has already started massive flooding, with more anticipated. The national higway has been breached deliberatly in a number of places by heavy machinery to minimize damage by removing the pressure created by the waterflow. Despite these measures the flood has in some places covered the road with redish water tanted with ash and lava. Local bridges are believed to be in significant danger. These actions severely disrupt transportation as the national higway circles the country and a distruption of this road has signifanct complications for residents in southern and eastern Iceland. The flood has started to threaten local farms and livestock- and may have more implications to agriculture around Iceland, threatening livestock with fluoride poisening from the ashfall. Update: 14.04.10: Yesterday afternoon, the volcano at Fimmvörðuhálsi was believed to have stopped erupting and the steady streams of lava gradually reduced to next to nothing and we at the Arctic Portal removed the live cam from the front-page. It now seems that this was only temperary and there seems as there is still a significant amount of activity under the glazier and residents in the region have again been relocated. There was a swift increase recorded in surrounding rivers and seismic activity has been on the rise indicating another eruption and it is believed that the lava may find another exit point this time, creating some uncertanity. Update: 07.04.10: Tragic news come from the south as the bodies of a woman and a man, who have been missing since nightfall monday have been found by the local search and rescue squad late last night. The third woman was found yesterday afternoon weary and cold after a long walk, and retreived by search and rescue helicopters. It is believed that the party of three went to the volcano on sunday and were on their way back on a Honda CRV, when they lost their way and got off track. Approximately 1 AM Monday the group requested assistance from teh local search and rescue squad, which searched for the group for five hours, while in constant contact with the group through a mobile phone. 6:30 AM the group cancelled the search, since the driver had managed to mobilize his car and find a trail to follow. Tuesday night search and rescue squad was contacted again, by the groups relatives who had not heard from them and were becoming increasingly worried. An extensive search was put in motion where 270 search and rescue personel searched the area by car, ski doos, on foot, cross-country skies and by helicopter. Yesterday afternoon the first woman was found by search and rescue squad, cold and weary but in good health. Later that day the two others were found, unfortunately already deceased. The woman 43 years old and the man 55. Update: 06.04.09: One of our Arctic Portal staff members Lilja Filippusdottir used her Easter holiday to venture to Eyjafjallajökull to see the volcanic eruption with her own eyes. Lilja is an experienced mountain climber and an active member of the local search and rescue squad in Akureyri Iceland. We saw this as the perfect opportunity to interview her about her journey and experience and to post it to our volcaninc coverage. "The trip started with a 4,5 hour walk, from Skógar up to 1000 meter height in between the two glaciers, Eyjafjallajökull and Mýrdalsjökull.The excitement made the walk easier than I expected. A steady, and chilling, northern wind blew straight in against us as we ventured up the mountain reducing the tempature down to -25° C. When passing by the last hill, suddenly a sight to the reddish explosions opened up, the viewpoint was crowded with people and vehicles, adoring the power of Mother Nature. When I came closer I could see the glowing fire-balls that shot up to the air with irregular rythms. A bit further down from the fissure Iceland's highest "waterfall" or "lavafall" runs down a steep canyon of 200 m. The fall looked like a red "thick soup" floating softly down the canyon.The majestic site seduced people to sit down for a while and just watch. The heat from the lava made it quite comfortable as well. When it started to get dark we headed down again, passing by the fissure. That was when it really struck me... it was the greatest "firework" show I have ever seen. Update: 31.03.09: A new fissure has opened up in Eyjafjallajökull. The fissure that geologist belive is dispersing lava from the same magma pot as the enitial fissure is aproximitely a 100 meters long. Local authorities state that the new fissure does not pose threat to residents in the area. The area has however been closed off by search and rescue temporarily until the extent of this new development is fully examined. On the 21 March Eyjafjallajökull glacier in southern Iceland, approximately 200 km from Reykjavík Icelands capital, erupted hurdeling lava and small rocks hundred meters high into the air. The volcanic eruption is considered a relatively small one and not estimated to pose any threat to the local community. During the beginning of the eruption a prompt evacuation of nearby villages was carried out and Icelandic airspace closed for arial traffic. It is estimated that around 500 people were moved from their homes to nearby towns. Residents have been allowed to go back home as the extent of the eruption has become clearer. The Arctic Portal will relay a direct webcam from the eruption to it's frontpage, giving it's viewer access to the event as it unfolds. Furthermore a historical overview of eruptions within Eyjafjallajökull and it's possible implications on the much fiercer volcano Katla will be given here below. Iceland sits on a volcaninc hotspot on the Mid-Atlantic Ridge, were volcainc eruptions are fairly common. Mostly, these eruptions occure in areas wich are sparsely populated and pose little threat to inhabitants or property. The last volcanic eruption to occure in Iceland, prior to this one, was in Grímsvötn in 2004. Perhaps the most interesting thing with the eruption in Eyjafjallajökull is that every time it has erupted in historic time, it has also set in motion an eruption in Katla, one of the most powerful volcanoes in Iceland. Eyjafjallajökull has erupted three times in known history, 920, 1612 and 1821, and in all of the eruptions Katla has erupted at a similar time and indeed there has been some sysematic activity registered over the last years that may indicate that Katla will erupt as well. As stated earlier, Katla is considered one of the most dangerous of Icelandic volcanos. It is located in souther Iceland not far from Eyjafjallajökull, just north of the town Vík í Mýrdal. Its peak reaches 1,512 meters in height and is partially covered by the glacier. The crater of the volcano has a diameter of 10km and the volcano normally erupst every 40-80 years, the last major eruption occuring in 1918. The Laki and Eldgjá craters are also part of the same volcaninc system, whicht can thus be regarded as one of the most powerful volcanic areas in the world. During the 1783 Laki eruption, a fissure with 130 craters opened up emitting lava and toxenus fumes reaching hights of 800-1400 meters hight or 2600-4600 ft. The ash fall is estimated to have killed over 50% of Icelands livestock and caused a famine killing approximitely 25% of the population. In Britain the sumer of 1783 was known as the "sand-summer" due to ash fallout and the effects of the eruption were clearly fellt in other place in Europe as well, with ash fall and poisonous clouds resulting in many thousands of deaths. The event caused very unusual circumstances over Europe as the winter in 1784 was very harsh. Unusuall number of storms and extreme frosts were detected.